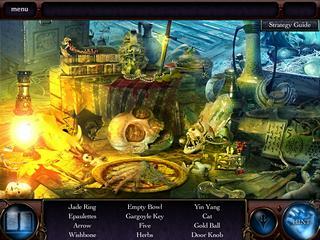 Theatre of the Absurd has been recently released into the hidden object puzzle adventure genre. The game seems to be like many of this genre - dark forces, chracters to be saved, all kinds of puzzles... But there is one particular thing about this game. This game is for those who apreciate the horror element of the games of this genre. This one is explicitely scary. For those who value the voice-over, it is very well done here. Having said all that, the game is still not disgustingly horrifying. As to the story of the game, You basicly have to become obsessed with a demon in order to fight back another demon. All that happens in a theater in the snowy Italian Alps. You play as a specialist in the dark arts, Scarlett Frost. She encounters this theater owner and his young daughter, both demon possessed. They were not really careful with the infamous and diabolical Hapsburg Cube that imprisoned a powerful and ancient Babylonian demon. The graphics seems a bit too simplistic at first, but then you become absorbed with all the effects. There is the ominous musical score, the whispers and sound of thunder, moans and cries. For those who value the voice-over, it is very well done and you have the main character that speaks to you at every turn and tells you what to do. 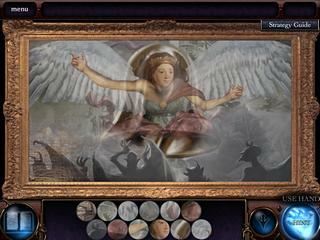 As to the gameplay, the hidden object levels are cluttered with items, and together with a bad lighting it makes it very difficult to find some of the items. You will have to play many puzzles and find many key object to use them later. The game has both strong and weak areas. The trial version might be helpful for you to decide if it's a buy. I would like to counter Fluffy's Bioshock susgogtiens by saying S.T.A.L.K.E.R. : Shadow of Chernobyl was the best singleplayer experience of all time. I checked its Wikipedia page a few years ago, and discovered that it came out that same day, so I trekked right over to the store to get it. My god was it an exciting time, my heart still races to remember the first time I came across a mutant boar. And for the times I was forced to leave sight of the sky *shudder*Also, I will never forget my first death in the zone. I came around a corner, was met with buckshot to the face, and watched in awe as my killer continued patrolling and a mangy dog snuck up and began to drag my corpse away to gnaw at it in the bushes.Bioshock is a dime a dozen. Memories like that, however, are priceless. This is Theatre of the Absurd review. Download this game here.